This travel blog has provided me with a much needed outlet and means for creativity since its inception many trips ago. But, in full transparency, my life has drastically changed for the better-due to a 140+ pound weight loss over the past year. Much of the foundation of this blog is generated and inspired from food, the fine, tasty, exotic delicacies of a new world, being a plus size gal in a European world and the numerous obstacles that often arise -good, bad and ugly -all too often- with yours truly the center of all the mayhem. In all intents and purposes, countless antics, international chaos and boundless antidotes were driven from the challenges faced above. I preface all this because-I have been experiencing writer’s block. Think of it this way-this trip is enhanced in every single facet due to a lack of these nuisances replaced by new and exciting nuances. However, since I have internally and externally changed-please bear with me that my writing, focus and content must adapt as well. Consider this “ A Girl, Her Hubs and a Suitcase- 2.0”- new and improved- higher in quality-fewer in calories and denser with more nutrient rich commentary. I hope you enjoy the new improved version and find it just as filling and satisfying as its predecessor. And, although it may lack a bit in flavor and culinary splendor it will certainly provide an equally stimulating entertainment experience. It is only appropriate to pay homage to the real architect of Copenhagen. Not a designer of structures, but of fairy tales and colorful stories. He is viewed as a national treasure in this region and there are references everywhere to his literary contributions. Denmark –a geographical appendage off of Germany and sandwiched within the Scandinavian neighbors of Norway and Sweden is the topic for today’s installment of A Girl, Her Hubs and a Suitcase. Centering primarily in Copenhagen will be the focus for the next 4 days followed by the nautical city of Hamburg, Germany. These roving rebels got a taste of the Scandic life last year in Norway and decided to stay with the revolutionary Viking theme. Although, Copenhagen has so much more to offer than that-but one needs to look beyond the hokey, tourist novelty of it-to see the true luster of Denmark. Arriving late in the afternoon jet lagged and weary-we caught a train to the downtown region. From the train, we set out on foot in search of our hotel. Cobblestone and rolling luggage is a bad combo. That is all I will say regarding this. After the frozen shoulder subsided and the blisters stopped throbbing, I am now able to laugh about getting a bit lost cursing the misfortune of the banning of Uber and lack of WIFI that subsequently waylaid our arrival to the lovely Scandic Front Hotel https://www.scandichotels.dk/front. This modern hotel is situated right on the water in the trendy Nyhaven neighborhood http://www.visitcopenhagen.com/copenhagen/nyhavn-gdk474735. Nyhaven is a pedestrian friendly, hip, energetic area with high end popular restaurants, bars and shops. The hotel is slightly out of the congestion but close enough to access all the fine places if needed. Tired and drained from the wears of travel, we showered and fell fast asleep, for the remainder of the night- very different than our usual first night exploration. However, this worked out well, as the next morning we arose before sunrise to take advantage of the hotel gym. Two peculiar and disappointing events occurred. Apparently, along with banned Uber- so is Pandora. This is a much essential requirement for me to exercise. Secondly, the equipment was reminiscent of the Ford administration. Making do with these sad “first world” problems, we made the best of it. Knowing without a doubt that we would earn our much needed steps from concrete and walking –all easily available to us. We partook in the yummy breakfast items on display for us. Fresh fruit, fancy cheese and numerous other treats -fueling our bodies for the long day planned ahead. Setting out in the early morning- the city was still asleep. Stores were still closed and the remnants of last night’s ruckus remained in the air. We walked to Starbuck’s and stuck with our usual morning routine, enthusiastic and eager for the itinerary the Hubs had worked so hard on. At 11 am we met outside City Hall http://www.visitcopenhagen.com/copenhagen/city-hall-tower-gdk688394 to meet up with the Copenhagen Free walking tour http://www.copenhagenfreewalkingtours.dk/index.html. I highly recommend any kind of walking tour option when getting to know a new city. Exploring on foot offers a unique connection that any other mode cannot accomplish. And, free is always a bonus. These local run operations are funded on tips-so you pay what you feel it is worth. This works out well for us and we avail these opportunities whenever it is offered in a city. Standing outside City Hall, one by one- an assembly line of cookie cutter “just married” couples sprung out the door steps- the grooms dazed and bewildered and the brides all beaming. Magnus, our rugged Dane tour guide was full of witty dialogue, a worldly spin on humor (he has a real issue with the Swedish) and a local take on Copenhagen that was clearly demonstrated in his expertise. Fast and spry, he leapfrogged through the streets with the eclectic group of 25 in tow snaking us all through the cobblestone streets quickly as he recited fun facts, useless tidbits and Copenhagen insider suggestions on future outing options. Among some of the memorable commentary in the fun packed 2 hours were: The Parliament, Carlsberg Beer, politics, World War II, The Royal Palace and a common theme of his benign and humorous “disdain” for the Swedish. After the tour, we walked through the greenest, lushest park King’s Garden-http://www.visitcopenhagen.com/copenhagen/kings-garden-gdk420899. This park dates back to the 1600’s and we were not alone in our pleasure. Everyone was out enjoying the magnificent sunshine. We saddled up to a bench to enjoy a light lunch under a serene tree. After lunch, we decided to activate our brain and just down the path was the National Gallery of Denmark –http://www.smk.dk/en/. We leisurely perused the paintings stimulating our art craving. After a few hours, brain drain and physical exhaustion began to creep in. Later that night, we walked across the waterway to the famous Royal Danish Opera House https://kglteater.dk/ for the opera Rigoletto. A timeless tale dating back to 1851 and first composed by Verdi-it is marveled as a classic. Well, something tells me-I should have paid attention to this “David Lynch” business. Let me talk about the positives first…. The venue itself is modern, clean lines and intimate. Our seats were incredible, spacious and comfortable, the voices angelic. Ok, the negatives….The show in itself was disturbing. A modern take on a classic, naughty transvestite nurses (to each his own- no judgement), a man baby with a diaper, onesie and a pacifier, a naked lady with improper grooming techniques and tassels, oh and subtitles in Danish and singing- of course in Italian. Well, the conservative, slightly uptight prude in me struggled with finding the “art” in this Pulp Fiction vs. Blue Velvet version. However, Hubs was clapping, applauding and standing “O” even for diaper man- along, with the rest of the I assume more liberal thinking Danes. Call me uptight, call me a “killjoy”, but I had to literally just close my eyes to try to take in the operatic melodies that these characters did indeed exude. I will never be able to “un-see” diaper man and that maybe the biggest tragedy of all, as well as the $200+ spent on the show. I would not call it a full on disaster because the orchestra was stellar and perhaps the most beautiful version of La Dona e mobile I have ever heard . I will include a link if you are curious-because most certainly you will recognize this song https://www.youtube.com/watch?v=8A3zetSuYRg . On the way back, in the cool autumn air, as the water illuminated under the moon’s gaze-I berated the poor Hubs and his entertainment selection. I went on and on and sadly on, missing out on all the beauty around me. For one brief moment, I had an outer body experience and saw and heard my pathetic self -mad over a tasteless (in my opinion) version of –let’s just be real folks- a luxury. I quickly readjusted my thinking-and shut it down-rest in peace diaper man. No need to belabor this discussion any further. This city is a millennial hotbed-young, loud, energetic and drunk at all hours –and conveniently -right outside our hotel window. Lucky for us-exhaustion and blissful sleep comes with this compact schedule. Sunday morning began wet, dreary and sunless. We made our way to The National Museum of Denmark –http://en.natmus.dk/. The museum is chockfull of Denmark history. It takes one on a 2,000 year journey through Denmark’s evolution with antiquities, displays and bric-a- brac emphasizing its significant impact on the world. It helped fill in some of the gaps and create a clearer picture of this country and its place as a world leader and influencer. 2 well spent hours were allocated here- well worth it and highly recommended. We stopped off at Starbuck’s to sit, relax and rejuvenate for our next activity-next on the agenda Tivoli Gardens http://www.tivoli.dk/. This is the place that inspired Walt Disney. Built in 1843-this amusement park screams old world. We happened to be there the last day of the season. We prepurchased our tickets. There are two options-one just for entrance and another additional pricing for unlimited rides. We chose to live on the edge and opted for unlimited rides as well. You walk into the entrance and you are instantly transcended back in time. It’s as if, I immersed myself in a Matisse painting during the French Impressionism phase. The park has a nostalgic presence to it, with old world charm and genteel elegance. Popcorn, cotton candy and waffles permeate the air in sugary delight. Multi-generations gather on the sprawling green lawn in canvas lounge chairs, soaking in the last days of warm sun. Children’s laughter echo behind the rumble of a thundering roller coaster and the staccato shrill of dare devil thrill seekers. The essence of pure innocence, timeless fun and forgivable gluttony seemed to be a common thread crossing all demographics. In the 23 years yours truly and Hubs have been together, amusement parks has never been our thing. Plus size and roller coasters do not go well together, therefore, for me-not something I truly enjoyed. Well, let me tell you-was I missing out! Hubs and I went on every ride that did not go upside down- his one and only criteria. Other than that-we tried everything. The laughter, exhilaration, adrenaline and pleasure were endless. We jumped from line to line-leaping in the buckets, seats, benches and other contraptions with nothing more than a wing and a prayer that this century old equipment would support us. The ride lines were almost nothing, minutes at most-if that. The rides itself were three times longer than any park I have ever been to. I laughed so much on one ride, my tummy muscles literally ached from the fervent belly thrusts. After a few hours, we sat on the plush lawn, in comfy canvas chairs as the fall air cooled as the sun faded. We sat like this for a long time. Snuggly and close, letting the happiness of the day settle in our souls, stocking up a nice reserve supply for a day many months from now, far from here where we may need to remember what pure joy feels like. But, for now-this moment- we treasured like sand slipping through an hour glass. Before we left, we had Thai at Wagamama- https://www.wagamama.dk/ -right in the park. As we left, a bittersweet joy/sadness resonated in my belly-knowing this day was pretty darn special and could never be replicated. Are you still following along? This day was a doozy. Hang on tight, because this story just keeps getting better. This morning after breakfast, Hubs talked me into yet another adventure yours truly has not done in her adult life. We rented bikes from our hotel. Everyone and I mean everyone-young, old, big, small-everyone-rides bikes here. Some more aggressive than other, some strange looking bikes that appear homemade, some fancy, some with pretty baskets-but they all ride bikes. So, as I eyed this device I gauged my smaller body parts and calculated my out of pocket insurance deductible-and I figured -why not? After a few painful, whining, fearful and irritating minutes for the Hubs particularly- I mustered up the courage and off I was on my ten- speed bike helmet on head cycling like a pro. The sun was intense and bright, the air was chilly and the new motion of my virgin limbs and joints went right into action. We rode by our hotel right on the waterfront. We passed large mast ships, tethered to the dock. We rode by a beautiful church St. Alban’s Anglican Church- http://www.st-albans.dk/. Built in 1885, perched overlooking the water-it was simply beautiful. However, a million photo snapping tourists agreed with that. So, we kept going. We made our way to the Little Mermaid statue http://www.visitcopenhagen.com/copenhagen/little-mermaid-gdk586951. This 100 year old bronze statue honors the fables of Hans Christian Anderson who wrote of a mermaid who gives up everything to live on land for her love of a man. Again, 1,000 eager camera snapping tourists surround the poor naked mermaid-hurdling over jagged, wet rocks-risking life and limb for that perfect shot. A couple snapshots were attempted by yours truly before cycling on. We continued down a path that led us to Kastellet- http://www.kastellet.dk/. This stunning fortress from the 1600’s -in a citadel shape is a working military barracks. As we rode by the changing of the guards, I immediately felt I was trespassing into another world. We parked our bikes and ascended up a path that overlooked the waterway below. Cannons displayed throughout the path. A bucolic wind mill stood stoically on guard. We sat at a bench taking in the warmth of the day and absorbing in the splendor that surrounded us. We made our way back to civilization. We had a nice picnic lunch of light snacks on the water before heading back to the hotel. From there, we divvied up all our dirty laundry, plopped it in our bike basket and made our way to a local laundromat. Using up every lost Krone we had (Danish currency) we enlisted the assistance of a sweet little Danish woman and communicating with charades, hand signals and finger pointing –we eventually were able to operate the machinery. Clean clothes in tow, we ventured back to the hotel. For dinner, we drove back across the water to Papiroen http://copenhagenstreetfood.dk/en/. 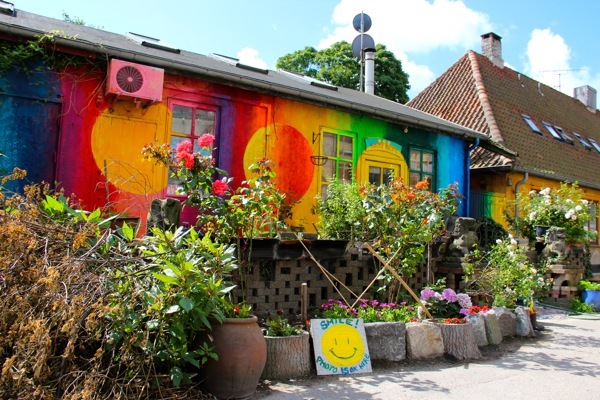 It is a unique dwelling with 40 food stalls- anywhere from vegan to pork and beyond. We circled around the popular place, taking in the many different smells before making a decision. I settled on a vegan burger with unique and tasty toppings on a bed of lettuce. Frank chose a pork sandwich, hand carved and presented beautifully. We both were content with our choices. The place is very unique, right on the waterfront and highly popular with young people. We rode our bikes back down the waterfront, burning off some of our dinner. The daylight was gone at this point; the winds began to kick up so we decided to call it a night. Tomorrow we fly out to Hamburg, Germany. We are looking forward to the remainder of our trip and what new and exciting adventures await us. Today was a travel day. These two wild and crazy kids usually rent a car and take a scenic route to the next location or live on the edge and take a train. But, in an effort to preserve time and energy, brilliantly masterminded by the Hubs –we opted to travel by plane. Upon our departure from Copenhagen, I reflected on our stay and solidly came to the conclusion that in our 3 short days there- we had fully and completely absorbed the city and its unique culture. I pondered on an interesting Danish notion called Hygge- (pronounced hoo-guy) that our dear free walking tour guide Magnus had offered to us that very first day. The link below offers a good explanation of the very elusive, ambiguous concept- http://www.visitdenmark.com/hygge-denmark-coziness, but I will attempt to provide my spin on it as well. Basically, Hygge is a feeling of intense wellbeing, family love, comradery and overall contentment. In the few short days we spent in Copenhagen, we started to see a common theme of this. Blond angelic blue eyed children in tow with their equally virtuous parents, demonstrating love, compassion and family unity. We saw it at Tivoli gardens-families three generations deep lined up, going on rides, spending the day together, void of what would appear to be any drama or discord. I realize this description is utopia, but since Denmark has been ranked the happiest country in the world three times in a row-I will allow the stats to speak for themselves. Regardless, at the time of the description, it was a moving target kind of idea, subjective in meaning and difficult to fully grasp-until it was actually witnessed in action. This, in turn has inspired me to fully embrace the Hygge philosophy incorporating its valuable benefits into the meaningful relationships in my life. One last thing about Copenhagen, before we move on…A special shout out to Scandic Front Hotel https://www.scandichotels.com/hotels/denmark/copenhagen/scandic-front –the staff really delivered. We approached the desk numerous times with questions, requests and suggestions. The team was always available and willing and helped in finding a laundromat, restaurant recommendations, calling a taxi , assisting in bike rental and greeting us every morning -adding much needed Hygge to our day. We took a luxurious Mercedes Taxi to the Copenhagen airport. Most of our commuting had been on foot, bike or train. So, the lavish taxi ride was much appreciated and well worth the money. After a quick (40 minutes) and a stress-free airplane ride, we arrived in lovely Hamburg, Germany. 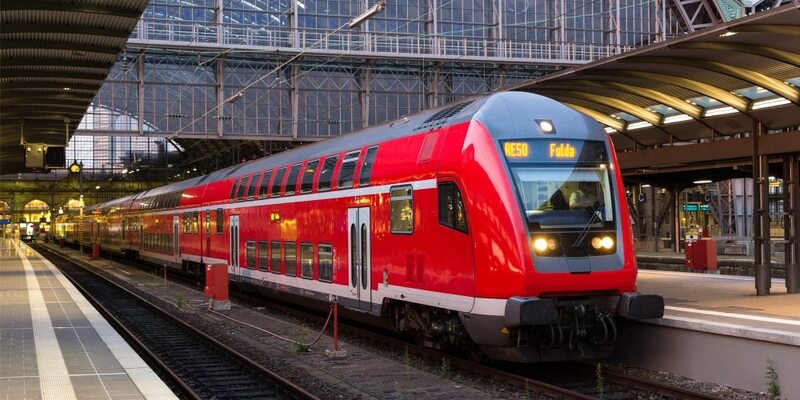 Our hotel Barcelo https://www.barcelo.com/en-gb/hotels/germany/hamburg/barcelo-hamburg/ is just minutes from the central train station, which we took from the airport. As we exited the train station we had a 50/50 chance of getting it right. Spilling out onto the street, a new world greeted us. Homeless individuals slept on the ground, clothes and belongings piled at their feet-polluting the air with a thick fog of intoxicating, pungent tobacco. The safe bucolic world of Hygge and Copenhagen’s spotless streets quickly evaporated and I realized I needed to be alert, aware and secure of my surroundings. Well, no sooner did I have that thought, that a lovely, older Indian gentleman approached us, inquiring if we needed help with directions. I realized shamefully, angels come in all forms. Do not judge. Look past the grit-have compassion. That sweet man was able to aid us in directions leading us to our hotel. We redirected ourselves, spilling out onto the opposite side of the train station. This was an entirely different scene. Busy worker bees hustling by, cell phones in hand, cyclists zipping past, store fronts such as Zara and Tiffany within my viewpoint. It was an alter universe from which I had just emerged from, but I was grateful to have seen it, creating an awareness and gratitude for the basic elements of life. Just a few blocks and we arrived to our hotel Barcelo https://www.barcelo.com/en-gb/hotels/germany/hamburg/barcelo-hamburg/. This hotel is simply stunning. It is perched within the center of the city; however, it is a quiet oasis in which no street noise is heard. It is a Spanish based hotel which is clearly displayed by its many Mediterranean details. Our room has everything one would need to provide comfort. The shower is beyond exquisite, providing a waterfall of loveliness akin to angel tears cascading down a hydroponic reservoir of Shangri-La divinity. The bed is a marshmallow cloud of tempurpedic heaven and the towels are spa-like thick, fluffy and the size of a bear skin rug. It is the small details that truly make the difference and offer luxury that ultimately enables a more enriched, peaceful and enjoyable vacation. After settling in, we ventured out to explore on foot. Fall is certainly in the air, providing a perfect backdrop that includes a rust colored carpet of leaves, a chill in the air and perfect accommodations for my well thought out and carefully planned autumn wardrobe. We walked to the City Hall which is in the main hub. Of note, in 1842 a fire essentially destroyed all of Hamburg, only to be rebuilt and incinerated by bombing again during World War II. Therefore, most of what is here today is from after that point. We walked around downtown, past fancy exclusive stores landing at a Starbuck’s. After some downtime and hydration-we found ourselves embarking on a cruise along the Alster Canal http://www.alstertouristik.de/English/classics/canal-trip.html. We boarded a large barge that could easily hold 100 individuals. But, there were only 3 other people on board with us as well the captain and his crew. We boarded just in time for sunset. The cruise was 2 hours long and about $20 (US) per person. We were given a crappy English audio that was hard to hear and kept breaking, so we essentially made up our own stories. The water way girth started out very wide- the width of a large lake, but as we continued the surroundings continually changed and waterway span varied to the narrowest at one point as the barge scraped across weeping willows. Friendly German residents waved with gusto from their waterfront Adirondacks, rowers resembling a Thomas Eakins portrait skimmed on by, swans bopped up and down rhythmically-literally going with the flow. The greenery and topography changed continuously, mansions 4 stories high in drastic German architecture lined up like toy soldiers all along the water flanking both sides. Bridge after bridge we passed, making note that there are over 2000 bridges along the Alster waterway. It was a truly pleasurable endeavor and I highly recommend adding this to your to do list if ever in Hamburg. Growing hungry, our hotel offered us a suggestion for dinner right down the road. We were hoping for authentic German food. We found ourselves at the cozy http://www.gasthaus-anderalster.de/. The décor of this establishment is simply charming. Old world European details dot the walls with cutesy wax famous figures throughout. German couples clanked and toasted large, intimidating beer steins as colorful plates of hearty German food emerged like an assembly line. Hubs, in his Fatherland, adores German food. He was in his glory. He had pork tenderloin, in a thick, orange colored sauce with golden crispy buttery potatoes. I opted for a mozzarella tomato plate that was truly divine. We shared earthy, robust hearty mushrooms –these mushrooms were heavenly little morsels of happiness. The best part of this meal was the price- roughly $35 (US). After dinner, feeling full but energized, I went to the hotel gym and did some cardio. After that, I slept like a baby after my enchanting shower and dreamlike cushion of love. This morning after my blissful shower, we made our way to breakfast. Different, unique, delectable delights awaited us. A cornucopia of new world items, specifically Spanish ones peppered the tables. Exotic honeycomb temptingly dribbled, tortilla omelet, cuisine I have only seen in Spain was offered, vibrant fruit, extravagant cheeses, alluring pastries and more. After breakfast we walked through the city, window shopping and burning off some of our breakfast. We made our way to the museum Hamburger Kunsthalle http://www.hamburger-kunsthalle.de/ . The large building held galleries that seemed to go on forever. The art was abundant and exceptional. We purchased audio guides which offered helpful explanation and kept us engaged. We spent the whole afternoon there. At the end, we were physically depleted and mentally exhausted-but satisfied and pleased with the experience. As the grey sky turned to raindrops, we made our way back to the hotel for some light respite. For dinner, we decided to roam the streets-uncertain of our dietary desires. As we gazed through one of the windows of the Rathaus (City Hall) we saw a dining room which housed beautiful fresco paintings and lavish chandeliers. Due to its apparent popularity and lack of better choices, we dined there- http://www.parlament-hamburg.de/. Hubs had a traditional German dish called Sauerbraten- a marinated meat dish. With it were bowling ball size potato croquets and an overwhelming mound of magenta colored cabbage. I had a veggie burger (German style) which was thicker than a hockey puck on top of a bed of greens that could have fed a family of four. I clearly was not going to finish this monstrosity of a meal, so I asked the waitress for a to- go box. A confusing game of huh/what? followed between language barriers and waitress indifference. In the end- apparently, a charge is issued for such a request. The waitress kindly tried to offer it, but by then, interest had faded. No fault of the waitress. The food a B-C+, but how many times in my life can I see I dined at Hamburg’s city hall. After dinner, with that lead bomb veggie burger wedged in my colon, I sought relief on the antiquated elliptical and then called it a night. Oh, glorious hotel shower. How you give me life. Your water pellets are like aquatic angels spraying sopranic melodies over my grateful dermis. Although, the set up in this hotel room is rather invasive for a modest couple-as the shower is smack in the middle of the room and the sink faces the bed. Not much room for vanity or privacy for that matter- keep this in mind if you find yourself booking a room at Hotel Barcelo in Hamburg. After breakfast we made our way back to City Hall to meet up with another free tour https://www.robinandthetourguides.de/en/. A spunky Australian named Phillip took us and our small group of 8 through the streets of Hamburg weaving fascinating tales of history, current events and pop culture. On the tour we visited St. Michael’s Church http://www.st-michaelis.de/en/ , Old Elb Tunnel http://www.hamburg-travel.com/attractions/historic-hamburg/the-old-elbe-tunnel/, Speicherstadt http://www.hamburg.com/sights/speicherstadt/ and Elb Philharmoni https://www.elbphilharmonie.de/en/. The tour lasted 2 hours and offered a great deal of information, sobering facts regarding the voracious fire of 1842 and the horrifying accounts of the World War II firebombing which destroyed the city in 1942. All in all, the tour was well worth it-again, working on a tip basis and if ever in Hamburg-pencil this much needed activity into your schedule. After the diverse group split up, we found ourselves in front of one of the restaurants Phillip mentioned in the tour. The Old Commercial Room https://www.oldcommercialroom.de/ from the outside it is pretty indistinct-however, inside it echoes history dating back to 1795. Our tour guide had pointed out that many celebrities frequent this establishment including their newly reappointed President Merkel. Additionally and more importantly, it is famous for its fish and meat dishes, particularly pickled herring and some sort of egg concoction that looked more like aquarium food for the seals instead of humans. You can imagine this vegetarian was at a loss- but fortunately they do have a few non-meat options. I settled on the creamy cucumber salad, playing it safe. It was unique and tasty and hit the spot. We made our way back to the hotel preparing for our evening’s event at the Ballet. For some, this kind of activity may not be your thing-but for us-this is an incredible treat-seeing the theater, viewing magnificent talent and indulging in a full evening of entertainment. We are almost certainly the only tourists that are ever at these venues. The Staatsope Theater http://www.staatsoper-hamburg.de/de/spielplan/stueck.php?AuffNr=145769 dates back to 1827. Several renovations took place after that and eventually once again it was completely destroyed in the fire-bombing air raids from World War II. The ballet we saw was Anna Karenina. The famous Tollstoy novel from 1878 was artistically and creatively adapted to a marvelous ballet. The orchestra was sublime. The ballet sequences were breathtaking. The presentation was 3.5 hours long but we were captivated every minute of it. Walking back in the damp autumn air, with dewy glistening leaves on the sidewalk-we looked over the city of Hamburg in absolute delight and amazement. The twinkling city lights bounced off the water, as if winking back at us with gratitude. We see your true potential, we see your beauty. Day 7 in Germany brought us glorious sunshine. The past couple days in Hamburg had been grey, dreary and far from picturesque. These weather details did not preclude us from enjoying ourselves in the least. But, the sunny skies were a warm welcome and helped in forming some of our plans later on in the day. After breakfast we made our way on foot to Mahnmal St. Niolai http://www.mahnmal-st-nikolai.de/. St. Nikolai Memorial is Hamburg’s most significant memorial that serves as a sober reminder of WWII and the catastrophic fallout from Hitler‘s dictatorship during 1933-1945 and subsequent destruction from the air raids on Hamburg in 1943. The topic of WWII absolutely fascinates me and being in an area that is rich in this subject matter makes only sense to absorb every bit of knowledge that is available. Our tour guide from the free tour Phillip had pointed out the museum that is housed below in the basement of the church. The church is no longer a functioning church as it was the target for the incendiary air bombing that took place in July of 1943. All that remains is a tower and in the ruins that were left- later become a museum of all the remnants left behind. We arrived just as the museum opened. We were the only ones there in the cold, quiet dwelling. The stillness offered an appropriate setting for such a somber subject. As we made our way through the history of the church, the noise level began to rise to an irritating, high pitched crescendo of 30 local teenagers. This annoying interruption seemed to last a long time. It undoubtedly encumbered our focus and became quite distracting. Eventually, a tour leader took over and his booming voice echoed in the open space, truly altering the experience. Somehow, we managed to block out the grating voice, but it seems to be a common theme on every trip- school age adolescents using these outings as a social event. On one hand, I commend school leadership for providing these enhanced educational options. On the other hand, careful planning, money and time went into our planning-and the indifference and inconsideration repeatedly seen by many of these youth aggravates me to no end. We continued on and a timeline began to come into place regarding how, when and where the bombing took place. On screen commentary of actual survivors lend a terrifying component to this experience. In the end, the endeavor called Operation Gomorrah that lasted 4 days generated statistics that are staggering. 40,000 residents died, 900,000 were homeless and displaced. One thing to note, I have witnessed this first hand and have observed it in previous trips as well to Germany. There appears to be a very palpable feeling of ownership with the atrocities that went on during the concentration camps, Hitler’s dictatorship and the futility of many of the evil acts performed on the people of Germany. As a Jew, I embrace this almost stoic kind of apology. This deference has provided me with a peek into the strength of the Hamburg residents and has allowed me to understand them in a more clear way. I will touch on this further on my wrap up of this trip. Included in the price of admission, one can also take the precarious looking elevator up to the top -80 meters for an obstructed view of Hamburg. It is not the best outlook, but does offer a bird’s eye peak of the city below. We spent a few minutes craning our necks and straining our eyes snapping pictures that will surely disappoint upon our return home. After all that heavy material, we lightened things up by making our way to Miniature Wunderland – http://www.miniatur-wunderland.com/. This unique and popular establishment- is basically a 6 year old boy’s dream-composed of 4 floors containing miniature “worlds” with complete railroads, small airplanes, cars and really everything and anything you can think of. No detail is too small and one world flows into the next. Small children, older adults and everyone in between are hunched over the displays, eyes big, mouths open and captivated by all the senses. Some of the elaborate exhibitions were Las Vegas, The Alps, Switzerland, Rome, and of course Germany as well as a fully operating miniature airport. We spent a ridiculous time, to the Hubs dismay- in the gift shop, stocking up on overpriced knick- knacks which is now currently threatening the restricted weight of my suitcase for home. From there, we exited with the sun beaming down on us. Due to the fabulous weather, we chose to make our way to the harbor, walking through the posh neighborhoods that led up to it. We passed by the fancy new https://www.elbphilharmonie.de/de/ an 800 million Euro project comprised of a hotel, a concert hall and shops. We chose not to go in as it more impressive being viewed from the outside. After lounging on a bench for some time, we made our way back to the hotel. For dinner we opted to re-visit Gasthaus An Der Alster http://www.gasthaus-anderalster.de/ from a previous night. I replicated the same meal of tomato and mozzarella, Hubs went with an authentic Wiener schnitzel. We have learned this lesson before that it is never the same experience the second time around. However, it was close to the hotel and hit the spot. After 3 days, any hotel breakfast no matter how good, gets monotonous-same irritating guests, same cheese, same sneering waitress. When this occurs, it is either time to change locations or in our case-it’s our cue that the end of the trip is near. After breakfast, we made our way to the bike rental Stadtrad-https://stadtrad.hamburg.de/kundenbuchung/process.php?proc=index&changeto=511. After numerous, frustrating attempts and profuse cursing, we were able to figure out how to rent the bikes through a computer kiosk at the bike station. Why they need your birth date is beyond me? Still unclear as well of the cost of this new found love of yours truly. Regardless, we figured out the complicated system and off we were in the damp cool air. We made our way to the Alster http://www.hamburg.com/explore/outdoors/alster/ and proceeded to loop around the beautiful bike path all along the water. We were up close and personal with the same view we experienced on our boat cruise the first day we arrived. We passed glorious, genteel mansions, the embassies, rowers, and many, many ducks. We spent the entire afternoon circling the beautiful path making our way back into town. We dropped off the bikes. At this point, the city was hopping. Throngs of teenagers, families, and couples were out in full force getting their shop on. Our final stop was Karstadt http://www.karstadt.de/ . This was a giant department store with everything one would ever need. We got lost in the gourmet chocolate section for an insane amount of time. We made our way back to the hotel. After another visit to the hotel elliptical, we made our way to Indian for dinner. Just a few blocks from the hotel we dined on some tame and slightly unmemorable Indian cuisine at The King of India http://king-of-india.com/ – a cozy and crowded Indian restaurant recommended by the hotel. After dinner, rain was falling pretty steady and the sky was black. We called it an early night as tomorrow we return to Copenhagen via train then back to reality from there. Today was our final day of travel. We always knew this day- anyway we cut it would be long, on the miserable side and not easy. We chose to fly to Hamburg from Copenhagen due to some of the complicated barriers. However, flying back to Copenhagen seemed impossible due to times, availability and other issues. Driving was out of the question-so a train seemed our only solution. Traveling by train has always been intimidating to both of us as there are many language barriers and instructions not translatable to us. Many of our fears came to fruition as we had expected. We left Hamburg mid-morning with the sun shining the brightest we had seen since our arrival. Schlepping 2 suitcases, 2 backpacks and loads of overpriced items that yours truly had to have along the way-we made our way to the train station. We waited 2 hours for our track to display on the board. Making our way to the track, bumbling our way down 2 flights of steps, then in front of the train to wait for another 30 minutes. During that time, savvy people around us started to gather in front of certain doorways, none near us. As the doors released, we bum rushed the train entrance attempting to get the first seats available. Well, there is something you must understand about Germany. They intensely take pride in rule following. This is a hard concept to understand to two stubborn knuckle heads who don’t know, understand or follow the rules (mainly again because not knowing them). So, as luck would have it-our $200 Euro train tickets (actually more than the 45 minute plane ride) in which would last us 5 hours offered us a ticket, but no SEAT RESERVATION. As we lumbered our way down the aisle with our girthy, plump bags, knocking innocent bystanders over and clopping them in the head with our equally overweight backpacks, one by one we were shunned as if we had a scarlet letter engraved on us. Each seat was reserved. Basically, “low life’s” like us -are not welcome. We went car to car until we reached the end-Hubs sweating, me in full blown “Jersey Girl” mode. “What the hell kind of system is this?” I barked as I swung from seat to seat trying to understand these ridiculous rules and circumstances. Eventually, we were shamefully sequestered like refugees on a raft to the entrance of the train, perched up against our now cumbersome luggage. As I squatted on the dirty floor of the train to make my home for the next couple of hours, I whined in my best “Jersey Girl” bravado to the very large and in charge, intimidating German woman collecting the train tickets. She snarled something equally irritating towards me and about me; I am pretty certain not complimentary. We eventually accepted our fate succumbing to the floor, nesting in my backpack, like a dog trying to circle their bed. We were actually some of the luckier ones, as surrounding the “Loser Pit” were individuals forced to stand the whole time. One gentleman in particular who tried to seek our assistance in what his ticket said. Pretty sad when someone is asking US for help. Later on, eventually this gentleman found a seat as we entered Denmark many hours later, only to be escorted off by a border patrol guard for not having a passport. His shoulders slouched as he went arm in arm with the guard never to be seen again. Our misfortune dimmed to this poor guy’s. After a couple hours, we were approached by a woman who informed us that we would have to depart off the train as we had to now board on a ferry. We had no idea this was to occur, but fortunately this ferry shortened the trip several hours. We disembarked the train and loaded onto a large ferry where we sat on the top deck. The sea gleamed below as seagulls trailed along us. The ferry lasted 45 minutes and then like cattle, we were shuffled back to the train, where Hubs and I quickly plopped our tuckasses in 2 of the 10 un-reserved seats. Not as fancy as the reserved seats but a far cry better than perched on a step. Apparently, the train was overbooked by many people, but somehow after the ferry the train appeared to be less full. We always purchase round trip airline tickets first and then build the trip around that in piece meal. It adds a bit of structure to the trip but really offers us much freedom to do with what we want within the confines of those days. Our initial plan was to go North up to Sweden and Stockholm. 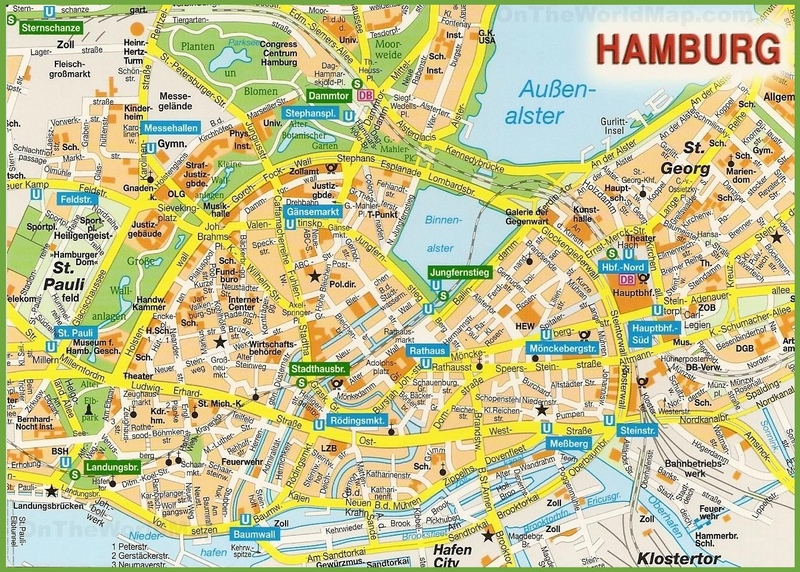 But as we created our trip, we noticed on a map the closeness in proximity Hamburg was to Copenhagen. Therefore, we worked our trip around that. One thing I want to say regarding expectations verses reality. In regards to the train-we actually envisioned a romantic dining car, me with white silk gloves and Hubs smoking a cigar (he does not smoke and I hate things covering my hands) but we imagined this old world experience where we would be playing cards (we did not bring cards) as we viewed the beautiful coastal cities as the train whirled on by. However, I have learned on these trips to adapt to the challenges that we face. As the plans change, I need to adjust my thinking, perspective and acclimate to what is provided. I did not do this gracefully or with pride as my “Jersey Girl” wrath was unleashed on Frau train lady. I am a work in progress regarding these shortcomings. We made our way on foot for the 30 minute journey, luggage in tow bouncing along the forgiving cobblestone. Eventually, we made it to our residence for only 12 hours-back in the same neighborhood, directly next to our former hotel Scandic Front- The Copenhagen Admiral hotel https://admiralhotel.dk/en/. This very unique dwelling is an old 18th century warehouse with many interesting details and armory. Unfortunately, our time is so limited that I will not elaborate. Hunger had settled in our bellies from a long day with only light snacking. We found ourselves at a mediocre Thai restaurant indulging in hot coconut soup. As we walked back to our hotel down the streets of Copenhagen one final time, we were grateful for an encore loop of the city. Copenhagen is a splendid city which much to offer. The people are friendly, happy (Hygge-remember) and very easy going. Many speak English and are accommodating in many ways. Hamburg is a real juxtaposition in cultures. I found the German people to be rigid and rule abiding, but stoic, brave and hard working. When I tally up their misfortunes that have been bestowed upon them through the years, I understand their strong nature. Between the horrific fire and the firebombing in 1943, the great people of Hamburg have learned to rebuild time and time again. Hamburgers are strong, resigned and focused. They are straight shooters, clearly defining the rules and always obeying them. I have to end this now as my sleep hours are diminishing. I hope you have enjoyed this fall’s installment of A Girl, Her Hubs and a Suitcase. Please join us in March as we travel to Kenya Africa on safari.